Sales of Sony’s Xperia A smartphone have doubled those of the Samsung Galaxy S4 at Japan’s main carrier, after a nationwide sales campaign that exclusively promoted the two handsets side-by-side. NTT DoCoMo, Japan’s largest mobile operator by contracts, said it sold 640,000 units of the Sony handset since its launch on May 17, while selling 320,000 of the Galaxy S4 since it went on sale a week later on May 23. Both phones are currently offered exclusively by DoCoMo in Japan, so the numbers provide a rare glimpse of their respective popularity, although their launch date and price to customers was slightly different. “One reason for the difference could be that after various campaign discounts, the up-front cost to new customers for the Xperia was ¥10,000 (US$105) less,” said DoCoMo spokesman Yoshifumi Kuroda. Kuroda said DoCoMo’s sales after the promotion were “much better” than last year, though he said the company is not releasing numbers for comparison. 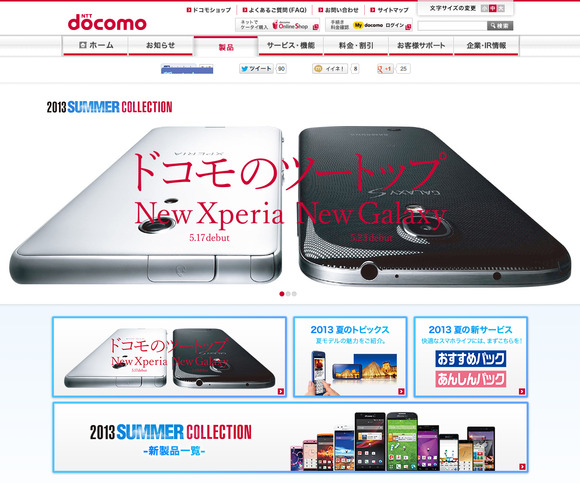 Last month NTT DoCoMo, the country’s largest mobile carrier, launched a summer campaign called “Two Top” that exclusively promoted the two phones, with large discounts for new users that included completely covering the cost of the handsets after an initial fee. DoCoMo is the only one of Japan’s main three mobile operators that doesn’t offer Apple’s iPhone, and the aggressive campaign was meant to win back customers it has lost in recent months without a flagship device. The numbers are a good sign for Sony, which needs a strong base of users at home to reach its goal of becoming the world’s third-largest smartphone manufacturer. Sony was third in Japanese smartphone shipments during the first quarter of 2013, prior to the latest DoCoMo campaign, with 13 percent of the market, according to numbers from IDC. Apple was first with 40 percent, followed by Sharp with 15 percent. Sony’s Xperia A is sold as the Xperia ZR outside of Japan, though the company says the majority of production is used domestically. The phone has a quad-core processor, 4.5-inch screen, and the ability to shoot HD photos and video underwater. The Japanese version includes some features for the local market, such as an antenna for receiving the country’s “One-Seg” TV signals for mobile devices.